Nearly 50 years ago, a real estate entrepreneur named Don Fisher had a problem: He couldn’t find a pair of jeans that fit, even after going to three stores. With his wife Doris, they decided to open their own store with jeans in many sizes and styles, a radical concept at the time. It was the first-ever Gap store. Today, Gap Inc. is a global retailer with six brands, over 3,100 company-operated stores and product sold in more than 90 countries. Customers still come looking for the perfect pair of jeans, but now their expectations for where, when and how they shop have transformed. As the company looks to the future, it is continuing its growth and role as a retail leader with a new cloud strategy announced Friday. Mobile checkout at Old Navy. Gilligan is leading the company’s technology evolution with Rathi Murthy, Gap Inc.’s chief technology officer. Their work will facilitate ongoing growth of the retailer’s active and value business, and support expansion of online and mobile services across its brands, including Old Navy, Gap, Banana Republic and Athleta. 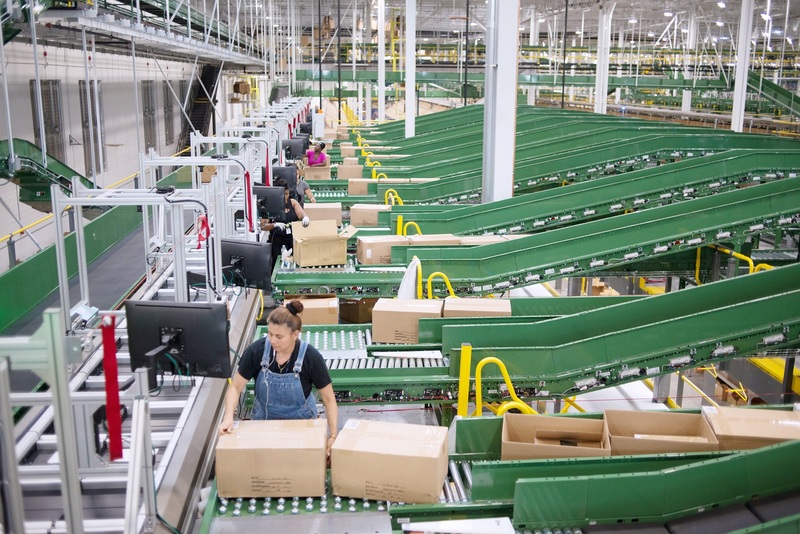 The elasticity of Azure will help Gap Inc. quickly scale for future holiday seasons, as the company migrates hundreds of applications to Azure over the next several years, starting with critical inventory, store and site management systems. Cloud capabilities will allow efficient, reliable scaling with all peaks and valleys of consumer demand – from holidays to back-to-school season – and streamline a supply chain that moves over 1.2 billion product units a year. Azure will also support the company’s DevOps model of rapid software builds, releases and tests. “Azure is going to play a very, very big role for us to be able to scale our business seamlessly,” Murthy says. Gap Inc. distribution center in Fishkill, New York. Gap Inc. is also building a centralized data platform on Azure to enable personalized shopping experiences and faster responses to a changing retail landscape, with more consumers shopping digitally and researching products online before they head to a store. The company will be able to better understand customers’ tastes and preferences with advanced analytics, data visualization and machine learning. It will be able to deliver tailored merchandising and marketing, and win more omnichannel, cross-brand shoppers. Such shoppers are valuable consumers and Gap Inc.’s most loyal customers. That’s why the company’s technology teams have made it easy to shop online across brands, with easy toggling between sites and universal checkout for customers to combine items from several brands, like Gap and Athleta, in a single cart that ships together. Headquartered where it began – San Francisco – Gap Inc. is also empowering its now-global workforce with Microsoft 365 solutions. The modern tools will help employees collaborate across brands and channels, and enable them to work faster and more efficiently through the company’s transformation. Murthy and Gilligan also share a passion for creating a modern, diverse workplace. Whether it’s developing female talent, working with students and community, or fostering innovation for everyone, the work is all part of a comprehensive strategy to build a faster, better Gap Inc.
To learn more about Gap Inc.’s digital transformation, read the press release. Top photo: Rathi Murthy (left), Gap Inc. chief technology officer, and Sally Gilligan, Gap Inc. chief information officer. All photos courtesy of Gap Inc.